We stayed in this hotel in September 2015.
roof top terrace, with one Jacuzzi, and sun loungers. The hotel overall we brilliant! The staff were soo lovely and kind and very helpful. The hotel has a very big pool so it was no problem getting the sun loungers as there was plenty available. The food was lovely and great choice! the only thing I would say that was a bit of a let down was at the back of the restaurant you could queue to get omelettes and eggs in the morning and in the evening you could go up and get meats but because there was only one serving and the queue was soo long our food was cold when we got back to the table so I would advise to queue first and then get your other food later but that was the only down side. Rooms at the hotel were quite large rooms and a modern feel. It looked exactly like the photos in the brochure. I believe the family rooms are larger again. We asked for a quiet room and over looked the road which we found was quiet and had views of the theme park which on a Saturday night would do a fire works display. Spent a week from 11th October, hotel was clean and staff very nice and helpful. Joined the H10 Club before out departure and received a little box of chocolates and 2 x free cocktails. Our room overlooked the front but the road noise was minimal with the patio door closed so didn't keep us awake. Free Wi-Fi in reception but no tables to rest your laptop, used the customer service desk usually with another person the other side. Apparently they used to have tables but took them away. There were a lot of Spanish staying and the food reflected this, they departed on the Sunday so the food was much more to our taste after this. One evening we even had French beans (the only time there was cooked vegetables apart from potatoes) but they reappeared for breakfast. One evening the soup was cold and had to be returned to the kitchen when I complained. Mostly enjoyed our stay but wouldn't recommend to others. This is our 3rd time in 4 years to this hotel which says how much we like it. It is clean and bright with friendly staff and good facilities. The only thing that could improve a bit was the food but when a hotel is catering for various nationalities then its not easy to please everyone. This was the 1st time we watched any of the entertainment and it was not bad and there is the Daisy club for kids. 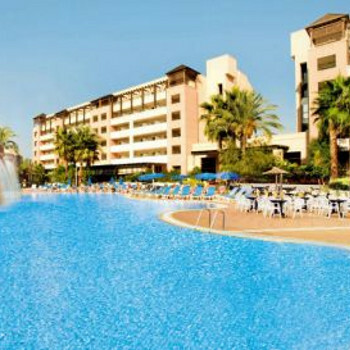 The hotel is set in a good location right at the edge of Salou about equal distance from centre and Portaventura about 10 minute walk to both. Rooms are a good size with balcony, 32inch LCD TV with around 90 channels although only 3 or 4 in English, a good size bathroom with bath and shower. The hotel also has free Wi-Fi in reception area. The Hotel Salauris Palace is one hotel where we would definitely go back to. Absolutely spotlessly clean and right next to Port Aventura Theme Park, so near you could almost reach out and touch the place. Central but at the same time tucked out the way a bit from the main area. Hotel facilities very good. Four lifts, two on either side of the foyer. Hotel staff were very friendly. The negative parts for us were the fact that the pool appears large but when you see everyone stretched out around it on sun loungers during the day it just looks like a mess with people sprawled out in all directions and the pool then looked small. The second negativity is the food. A lot of it is geared for the foreign (not British) palate. Some of the food being served looked truly weird and breakfast was a bit of a chore, same old, same old. The restaurant itself was clean and staff were brilliant but we don't rate the food much. We ate a lot of fruit and tried to eat chicken and things like that but some of the other stuff was disgusting looking. On the roof of the hotel is sun loungers and a Jacuzzi. It was a bit embarrassing stepping into the Jacuzzi, having to turn it on as it was really quiet up there and then you switch this Jacuzzi on and it upsets the quietness as it’s noisy. We would definitely go back to this hotel. We were given a massive room looking out towards the theme park so we could watch the rides and could actually hear people screaming on them! We were glad to be on that side as having a pool view would have been really noisy in the end up. Would absolutely recommend you try this hotel at least once. This was my first time staying in a hotel in spain and I will definitely be going back. The staff were very friendly but not intrusive. The room was cleaned every day and towels were changed if required. Didn't use the spa but it looked good. They have a book swap area which came in very handy as I do like to read when I am by the pool. The pool was cold but that was just how I like it. The food was in my opinion excellent. We could not fault this hotel it was spotless and the rooms were quite spacious. The food was the only thing that let this hotel down as far as im concerned, there wasnt much of a choice if you dont like meat or salad. The maids were in every day cleaning your room and fresh towels everyday. I would go back to this hotel. Stayed at the H10 Salauris Palace Hotel in September 2008. Having stayed at a previous 4 star H10 hotel in another resort, we expected the standard to be the same which was excellent. Unfortunately we were sadly disappointed. We would not recommend this hotel to anyone. The food is cold, uncooked and inedible. We tried visiting the restaurant at different times but this was to no effect. We only ate twice and had to go out every other night for a meal. Ridiculous when you have paid for Half Board. The maid service may be good regarding cleanliness but the noise made by them from 7.30am is annoying when the purpose of a holiday is to relax and have a lie-in!! Not possible when the scraping of furniture and slamming of doors is horrendous! On a positive, the pool area is good, snacks at the pool bar are good and the reception staff are most helpful. Would strongly not recommend this hotel as it definitely is not a 4 star by any stretch of the imagination, it is more like a 2/3 star. Stayed for 2 weeks, mid June. The hotel has good facilities, some bits need upgrading, like the sports equipment. The kids can't take anything to play with into the pool which is a shame, the hotel put inflatables in on a Thursday for 2 hours. The entertainment team work very hard, our children really liked them as they put a lot of effort into getting them involved. The food could be really good some nights, not so good others. We always found something we liked. The restaurant staff are not so friendly with the Brits, the same everywhere really! The rooms are spacious, with good storage, but you can hear everything (literally!) through the walls. Don't expect to get an afternoon siesta either, as the maids work all day and shout to each other along the corridors. There were a few power cuts while we there and we got trapped in the lift as a result for about 10 mins, my son thought that was very exciting! The hotel is well placed for Port aventura and a short walk into town. Evening entertainment is a bit hit and miss, we walked into town a couple of nights to get cheaper drinks! I would def stay in a H10 hotel again, but as for Salou...not for us! My husband and I have just returned after two weeks at the saluaris palace hotel and I must say that we now need another holiday. The hotel was well located for the port aventura theme park ideal for people with children as it is only a 10 minute walk. What can I say posotive about the hotel ? Rooms were clean but not overly spacious and the maid gave us some extra coathangers! The novelty of room 301 is that the very nice marble sink top extends over the top of the toilet seat so that you have to sit on the toilet sidesaddle! The staff at the hotel are quite unfriendly towards the british but quickly took euros without blinking it cost us 80 Euros to hire a fridge (Empty at that) and kettle for two weeks, I thought this rather strange as the fridges are already in the rooms and turned on so surely as with the safety deposit boxes it would be easier just to give people the keys to the fridges when they book in. As for the food my husband is a hgv1 driver and has eaten better in Romanian accomadation. All I can say is the salauris palace will not be receiving any recommendations from myself and is letting down the reputation of the H10 chain.